Three people hurt, one critically, when Gaza rocket explodes in Gan Yavne, near Ashdod. One person was critically wounded on Friday evening, when a rocket fired from Gaza exploded in the city of Gan Yavne, in the Ashdod region. Two other people were lightly wounded from the rocket, which reportedly hit a vehicle. Magen David Adom paramedics took the victims to the Kaplan Hospital in Rehovot. The attack comes hours after a four-year-old was killed when a mortar launched from the northern Gaza Strip directly slammed into a car. The incident occurred in a kibbutz in the Sha'ar Hanegev regional council. According to Channel 2 News, terrorists in Gaza fired a barrage of mortars at the kibbutz, one of which exploded in a location near where the boy was standing. The boy sustained critical injuries, and rescue services rushed him to hospital. A short time later, he was pronounced dead. 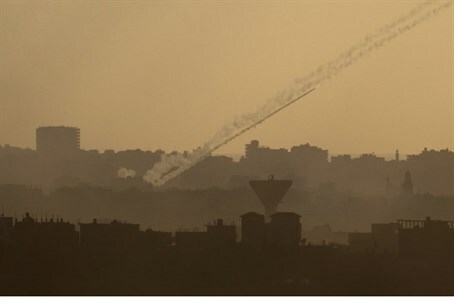 Gaza terrorists fired more than 90 rockets at Israel on Friday, and the attacks have continued throughout the evening. A rocket fired earlier on Friday afternoon caused considerable damage to a synagogue in the southern Israeli city of Ashdod. Also on Friday, a rocket struck just 12 meters from a kindergarten packed with children and teachers. It was part of a five-rocket salvo from Gaza; the Iron Dome intercepted two others over the city of Ashkelon, and three fell on communities in the western Negev, one of which struck close to the kindergarten.